Who is Nile Rodgers? This BioClip will enlighten you. Nile Rodgers career and life. Nile on production and songwriting. Nile Rodgers & CHIC Montreux Festival 2012 Promo. Among music legends, Nile Rodgers is truly exceptional. He amplifies his legacy as a multi-Grammy-winning composer, producer, arranger and guitarist by constantly traversing new musical terrain and successfully expanding the boundaries of popular music. As the co-founder of CHIC, Rodgers pioneered a musical language that generated chart-topping pop hits like "Le Freak," sparked the advent of hip-hop with "Good Times," and won CHIC eleven Rock and Roll Hall of Fame nominations. His work in the CHIC Organization and his productions for artists like David Bowie and Madonna have sold over 200 million albums and 50 million singles worldwide while his innovative, trendsetting collaborations with Daft Punk, Avicii, Disclosure, and Sam Smith reflect the vanguard of contemporary music. Fueling four decades of pop anthems with more than 200 production credits to his name, the scope of Rodgers' peerless influence is undeniable. If 2016 is any indication, Nile Rodgers is already setting more precedents in his own illustrious career. Rodgers (along with Bernard Edwards) became the latest inductees of the Songwriters Hall of Fame in June. In 2015, he produced, performed, and hosted the inaugural FOLD Festival, a two-day, all-star concert presented at Martha Clara Vineyards on Long Island featuring an "eclectic, genre-spanning set" (Rolling Stone). The success of FOLD 2015 inspired Rodgers to expand the brand worldwide and take it to the UK with the three-day FREAK OUT! LET’S DANCE!! LONDON Festival in June 2016. It was the first ever music event at London’s historic Fulham Palace. Signed to Warner Bros., Rodgers is currently recording It's About Time, the first new CHIC album in 25 years. "I'll Be There," the album's first single, went to #1 on the Billboard Dance Charts, while the accompanying video generated nearly three million views in less than a week. Additionally, "Le Freak" was inducted into the 2015 Grammy Hall of Fame and Rodgers was elected to the NARAS Board of Governors and received the President's Merit Award during the Recording Academy's 8th Annual Grammy Week Celebration for the Producers & Engineers Wing of NARAS. One of the world's most dazzling headliners, Rodgers continues to tour globally with CHIC. A native New Yorker raised in the city's thriving bohemian subculture, Nile Rodgers established the CHIC Organization Ltd. after partnering with bassist Bernard Edwards in the Big Apple Band. Between 1977-1983, CHIC's blend of jazz, funk, and disco dominated the airwaves and has since influenced a range of hip hop and EDM acts, ultimately distinguishing CHIC as the "most sampled band in history" (The Guardian, 2011). Their streamlined yet sumptuous grooves powered "Everybody Dance," "Dance, Dance, Dance (Yowsah, Yowsah, Yowsah)," "I Want Your Love," "Good Times," and "Le Freak" — the biggest-selling single in Atlantic Records' history. Amassing a mountain of gold and platinum awards, Rodgers and Edwards revamped Sister Sledge with the chart-topping We Are Family (1979) album, which included "Lost In Music," "He's the Greatest Dancer," and the Grammy-nominated title track. They wrote and produced the best-selling album of Diana Ross' career diana (1980), spawning signature hits like "I'm Coming Out" and the number one "Upside Down." Beyond the CHIC Organization, Rodgers has achieved commercial and critical triumphs for artists like David Bowie (Let's Dance), Duran Duran ("The Reflex"), and Madonna (Like A Virgin). He's remained on the cutting edge of pop music working with countless icons like Michael Jackson, Bob Dylan, Steve Winwood, Grace Jones, Bryan Ferry, Peter Gabriel, and Eric Clapton. His boundless talents include scoring music for films like the blockbuster Coming to America (1988) and distributing soundtracks for popular AAA video games via his national distribution company and record label, Sumthing Distribution and Sumthing Else Music Works. He regularly gives keynote talks at events for noted media companies like FremantleMedia and conferences like Google Zeitgeist. Complementing his creative endeavors, Rodgers is Chairman and Founder of the We Are Family Foundation (WAFF), a non-profit organization he launched in 2002 that's dedicated to the vision of a global family by creating and supporting programs that promote cultural diversity while nurturing the vision, talents, and ideas of young people who are changing the world. 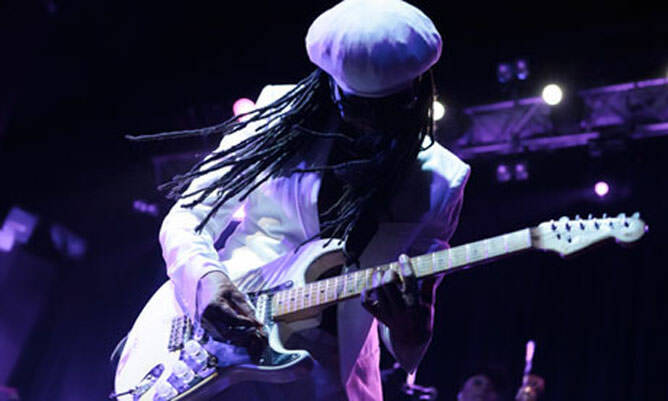 As a cultural icon and music innovator, Nile Rodgers transcends all styles of music across every generation, whether headlining Glastonbury 2013 or producing star-studded concerts for Montreux Jazz Festival. After surviving an aggressive form of cancer, he published his critically acclaimed self-penned autobiography Le Freak: An Upside Down Story of Family, Disco and Destiny (2011) and was subsequently the subject of two documentaries, BBC Radio 4's Nile Rodgers: The Hitmaker (2013) and TV One's Unsung: Nile Rodgers & CHIC (2014). His collaboration with Daft Punk on "Get Lucky" and Random Access Memories (2013) earned three Grammy Awards, including "Record of the Year" and "Album of the Year." "The full scope of Nile Rodgers' career is still hard to fathom, and it's not just ongoing, it's in overdrive," remarked Rolling Stone, who named Rodgers one of "the 50 Most Important People in EDM" (2014). Indeed, there's no shortage of superlatives or accolades to convey the impact Nile Rodgers has made in popular music. From "Good Times" to "Get Lucky," Rodgers' unrivaled track record is a mere glimpse of what's yet to come. NOTE: These images are larger than they appear! We use a new, cutting edge technology to rewrite the core code of a JPEG to make the image smaller in file-size (about 5x's smaller) while, at the same time, retaining it's full quality. Happy Downloading! All images copyright and courtesy of Nile Rodgers Productions. All rights reserved.